Jagjit Singh (8 February 1941 – 10 October 2011) was an Indian ghazal singer, composer, music director, activist and entrepreneur. Known as "The Ghazal King", he gained acclaim together with his wife, another renowned Indian ghazal singer Chitra Singh. Together, they were popular in the 1970s and the 1980s as the first ever successful husband-wide duo act in the history of recorded Indian music. Together, they are considered to be the pioneers of modern ghazal singing and regarded as the most successful recording artistes outside the realm of Indian film music. He has sung in Punjabi, Hindi, Urdu, Bengali, Gujarati, Sindhi and Nepali languages. He was awarded India's third highest civilian honour, the Padma Bhushan, in 2003. Singh is credited for the revival and popularity of ghazal, an Indian classical art form, by simplifying the complex form of ghazals into a simpler form of ghazals by amalgamating ghazal and geet. His music became popular in mass media through films such as Prem Geet (1981), Arth and Saath Saath (1982), and TV serials Mirza Ghalib (1988) and Kahkashan (1991). 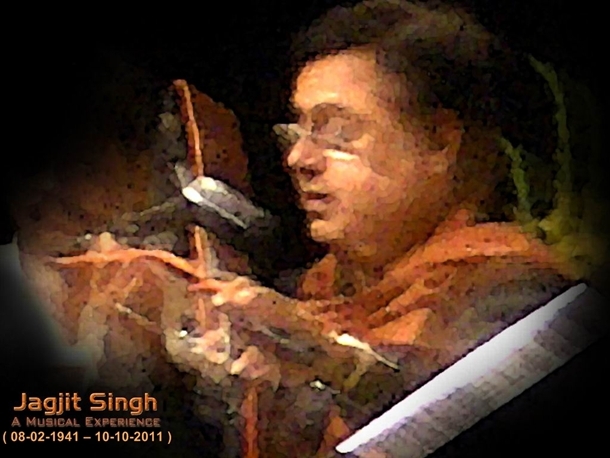 Jagjit Singh is considered to be the most popular ghazal singer and composer of all time in terms of commercial success. With a career spanning over five decades and a repertoire comprising 80 albums, the range and breadth of his work has been regarded as genre-defining. He is the only composer and singer to have composed and recorded songs written by Prime Minister - Atal Behari Vajpayee - also a critically acclaimed poet - in two albums, Nayi Disha (1999) and Samvedna (2002). Jagjit Singh was the first Indian composer (and together with his wife Chitra Singh the first recording artist) in the history of Indian music to use digital multi-track recording for their album Beyond Time (1987). Together with sitar player Ravi Shankar and other leading figures of Indian classical music and literature, Singh had voiced his concerns over politicisation of arts and culture in India and lack of support experienced by the practitioners of India's traditional art forms, particularly folk artists and musicians. He had lent active support to several philanthropic endeavors such as the library at St. Mary's School, Mumbai, Bombay Hospital, CRY, Save the Children and ALMA. Jagjit Singh was born in Sri Ganganagar, Rajasthan to Amar Singh Dhiman, a government employee, a native of Dalla village in Punjab and his mother, Bachan Kaur from Ottallan village, Samrala. He had four sisters and two brothers and he was known as Jeet by his family. He was raised as a Sikh by religion. He went to Khalsa High School in Sri Ganganagar and then studied science after matriculation at Government College Sri Ganganagar and went onto graduate in Arts at DAV College, Jalandhar. He is a post-graduate in history from Kurukshetra University in Haryana. Although his late father always wanted him to pursue IAS as a career, he took immense pride in his son`s achievements in the world of music today. His association with music goes back to his childhood. He learnt music under Pandit Chaganlal Sharma for two years in Ganganagar, and later devoted six years to learning Khayal, Thumri and Dhrupad forms of Indian Classical Music from Ustad Jamaal Khan of the Sainia Gharana school. Popularly known as "Ghazal King", Singh gained acclaim together with his wife, singer Chitra Singh. Chitra stopped giving public performances after their only son, Vivek, died in a road accident in 1990. But Singh continued to sing, singing with equal ease in Punjabi, Hindi, Urdu, Gujrati, Sindhi and Nepali languages. He was awarded the Padma Bhushan in 2003. The Vice-Chancellor of Panjab University and Kurukshetra University, Late Professor Suraj Bhan encouraged his interest in music. He arrived in Mumbai in 1965 in search of better opportunities for being a musician and singer. His early struggle in the music industry, though not too harsh by his own account, still had its share of trials and tribulations. He lived as a paying guest and his earlier assignments were singing advertisement jingles. Singh was first offered to sing in a Gujarati film, Dharati Na Chhoru produced by Suresh Amin. Jagjit Singh underwent surgery after he suffered a brain hemorrhage. Doctors at the hospital performed an emergency surgery on Singh. Dr Ajit Menon, a cardiologist, Lilavati Hospital, said, "He suffered a brain hemorrhage and underwent a surgery to remove clots in his brain. His condition is critical". The doctors continued to monitor him in the intensive care unit. He was breathing with the aid of a ventilator. Singh had a history of heart ailments. In January 1998, he suffered a heart attack, which led him to quit smoking. In October 2007, he was hospitalised following blood circulation problems. Before this illness, his last major concert was held on 16 September 2011 in Nehru Science Centre, Mumbai. His last concert was held on 20 September 2011 in The Indian Public School, Dehradun. He died on 10 October 2011 at the age of 70 in Mumbai at Lilavati hospital.